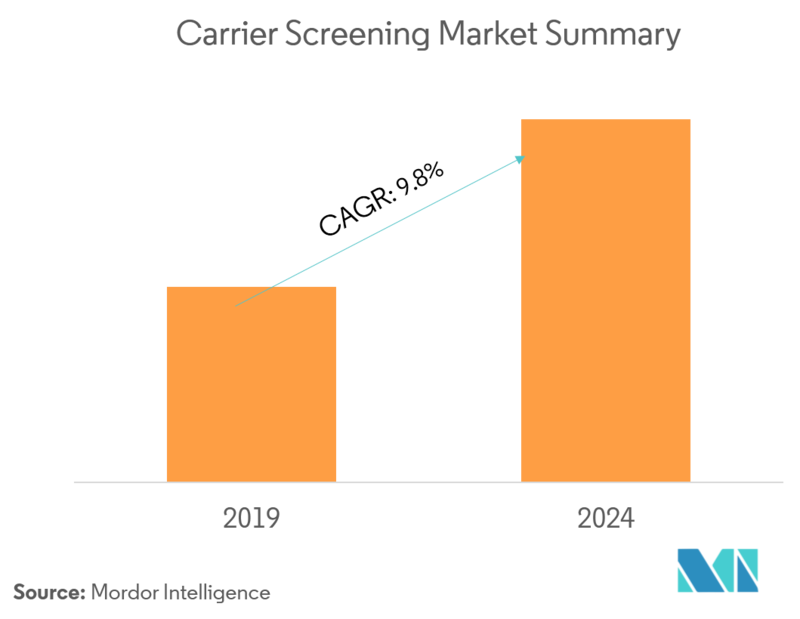 The major factors for the growth of the carrier screening market include the increasing emphasis on early disease detection and prevention, rising demand for personalized medicine, and increasing application of screening tests in genetic disorders, which is expected to experience a boost during the forecast period. The earlier a disease is diagnosed, the more likely it can be cured or successfully managed. Treating the disease early could also make the disease easier to live with. Early disease detection helps people plan ahead, while they are still able to make important decisions regarding their health and support needs and on financial and legal matters. Genetic diseases, such as cystic fibrosis, sickle cell anemia, and Tay-Sachs disease, are inherited disorders. Carrier testing for such diseases can provide information about a couple’s risk of having a child with a genetic condition. Identification of the risk, prior to the onset of symptoms, is called predictive/presymptomatic testing. Many genetic disorders can be detected early during pregnancy. So, the consumer demand for safe and effective carrier tests is fueling the growth of this market. In addition, the adoption of carrier tests into regular clinical care offers a commercial advantage to the market. According to many studies, early detection of diseases can prevent them completely or at least decrease the complications of the diseases. Healthcare organizations in several countries are funding newborn screening to predict diseases, like cancers, which may occur later in adulthood. As per the scope of the report, carrier screening is a type of genetic test to identify the autosomal recessive genetic disorders, before or during a pregnancy stage. Further, it helps in identifying a child with a genetic disorder. The market is segmented on the basis of screening test type (molecular screening test/biochemical screening test), disease type (cystic fibrosis, Tay-Sachs disease, sickle cell disease, gaucher disease, spinal muscular atrophy, and other autosomal recessive genetic disorders). 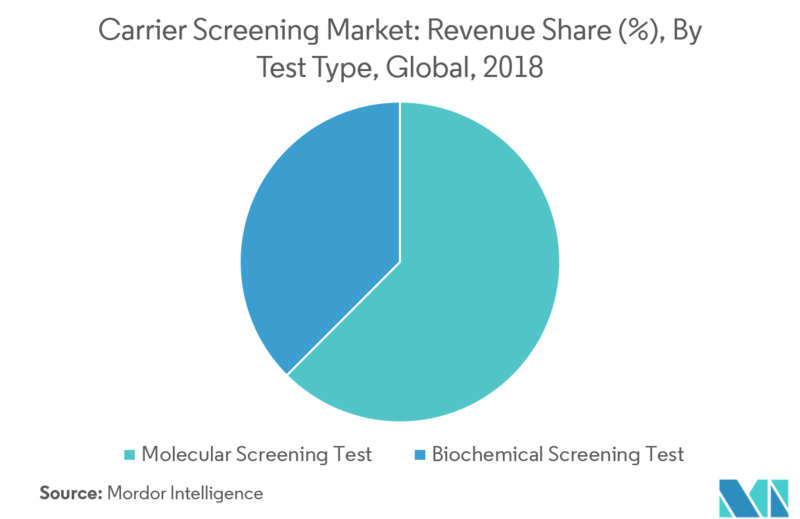 In developed countries, such as the United States, Germany, and France, among others, the demand for screening tests to detect the risk of genetic diseases is driving the market’s growth. A molecular screening test identifies DNA mutations, which are variations in the genetic code that lead to decreased production of enzymes. It focuses on the mutations seen in one ethnic group. It involves a step-wise process of testing for common alleles, and if required, extensive gene analysis. Sequencing is a method of molecular screening, which is accomplished by reading across the DNA code of a specific gene to know if there are any known mutations. If the test results are negative, it reduces the chances that the individual is a carrier, however, it does not eliminate the chance of having a carrier gene, since it is possible that the mutation might not have been discovered yet through the current technology. Some of the prominent recessive disorders for which molecular testing is beneficial are Canavan disease, Cystic fibrosis, GM1 gangliosidosis, spinal muscular atrophy, etc. With advancements in genetic analysis tools, like assays based on next-generation sequencing and microarray technologies, molecular diagnostics are revolutionizing the practice of medicine, by improving the prenatal and reproductive care, enabling earlier disease detection, and advancing the treatment for heritable diseases. There is an expansion of molecular testing, as it has the potential to increase testing accuracies through technical benefits for many targeted disorders that may not be suggested to biochemical testing. 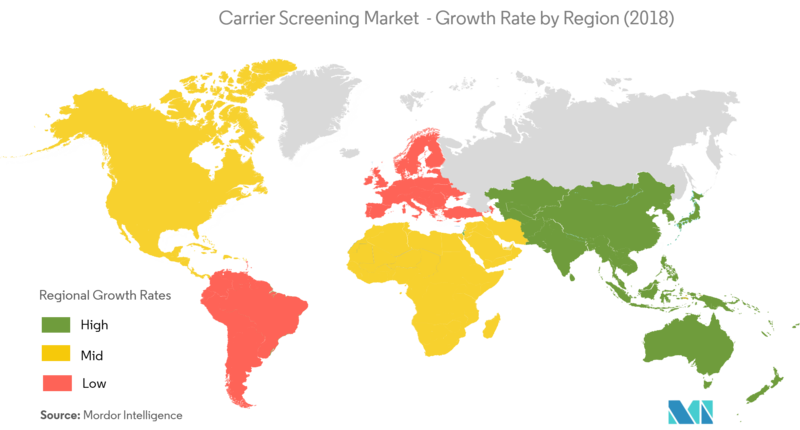 North America is found to hold a major share of the carrier screening market and is expected to show a similar trend over the forecast period, without significant fluctuations. Genetic disease is the leading cause of infant deaths in the United States, accounting for approximately 20% of the total annual infant mortality. Many advances in genomic medicine and technological platforms have made possible low-cost, pan‐ethnic, expanded carrier screening that enables obstetric care providers to offer screening for over 100 recessive genetic diseases. However, the rapid integration of this genomic medicine into the routine obstetric practice has raised some concerns about the practical implementation of carrier testing. According to the Cystic Fibrosis Foundation, more than 30,000 people suffer from cystic fibrosis in the United States, and approximately 1,000 new cases of cystic fibrosis are diagnosed each year in the country. Thus, as the prevalence of genetic diseases is increasing every year, the usage of carrier screening is also expected to increase during the forecast period. 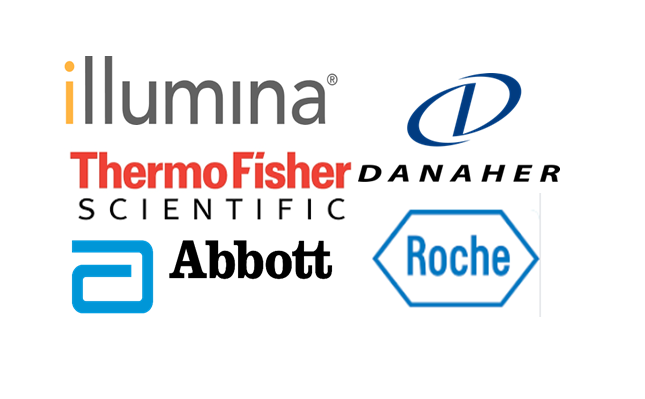 The presence of major market players, such as Abbott, F. Hoffmann-La Roche AG, Cepheid (Danaher Corporation), Illumina Inc., and Thermo Fisher Scientific Inc, in turn, is increasing the overall competitive rivalry of the market. 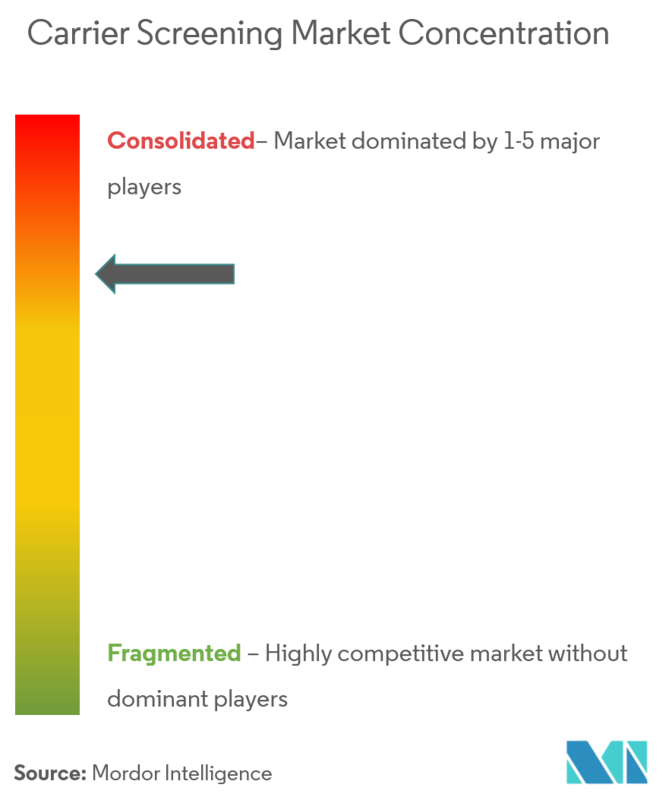 Most of the market players are expanding their technologies through acquisitions and partnerships. For instance, in January 2017, Philips and Illumina collaborated to offer the integrated genomics solutions for oncology.